A short poetry collections book which focuses on real life experiences of two young South Africans in terms of events that have taken place in their lives. They bring down the barrier between fiction and reality and which makes it an interactive reader for one which makes life seem like a dream. Originality originate from the literature pieces that are written by Kearabilwe Bernice Moletsane, as Kelly Bernice ,along with kgothatso Nkwana, as Khudi. Each and every piece makes readers and the audience to get to feel the type of life phases, journeys and encounters that most people experience in their daily lives. Enigma is a must read poetry book that diversifies the concept of happiness and pain bringing them together and showing individuals that life has its own way of working out and that it's never to late to start over and make the most of what you have. The book is merely inspired by circumstances that are encountered in life and it's a communication tool that is used to express the impact of what is being experienced by the two characters in their mysterious life journeys . 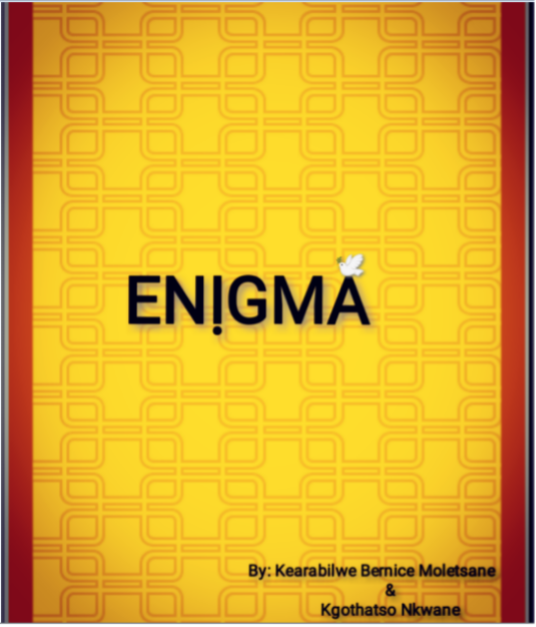 The Enigma book and film is an interactive literature and performing art tool that makes readers and viewers to relate in each of the poetry pieces in the book . We all sometimes don't know whether we taking the wrong path in life when making decisions or choosing a path for self growth. Gratitude plays a great part in our lives which is something we ought to be great-full for and that we must acknowledge that as much as we believe in the higher power , either being an idol or a certain mantra. Our own actions can determine the outcomes of situations that we face through out our life journeys. Most people believe In things that they are mostly told and which they become motivated by, yet this books makes one realize that everyone has their own true potential according to what they can actually achieve in life as a whole and which is something most individuals struggle with. Enigma poetry book is also a component that makes a difference in our daily lives as human beings. We hope Enigma poetry book serves well as an inspiring tool for others.